WestonDon wrote: I believe that lefties like Mad Max are trying to goad their followers into provoking conservatives into violence, preferably with a gun, even if it means some of their followers get killed. My MAGA hat has been staying home lately but not my EDC. Tweed's iron triangle of trouble needs a fourth leg, at least temporarily. Bad people, bad things, bad places, lefty zealots. Immediately after Columbine some slacker behind the counter at Starbuck's said of my NRA cap, "It must take guts to wear that these days." to which I replied, "Why? Who's going to make me take it off?" I think she's been living in a far-left environment for so long that she actually thinks following through with her suggested behavior is acceptable and will result in minimal consequence. The sad pet is she's more correct on that point (the lack of actual consequences) than our society would like to admit. rattlehead wrote: I think she's been living in a far-left environment for so long that she actually thinks following through with her suggested behavior is acceptable and will result in minimal consequence. The sad pet is she's more correct on that point (the lack of actual consequences) than our society would like to admit. Getting a 147gr. JHP between the eyes isn't exactly "minimal". And that's EXACTLY where this is headed. We’re running out of cheeks to turn. Judicial Watch filed an ethics complaint against Marxist Waters for inciting violence. There is one thing that Mad Max said that i actually agree with. In response to comments from Senator Schumer that criticize her comments she said that leaders like that will do anything to stay in their position. Schumer and Pelosi didn't criticize Waters cause it was the right thing to do. 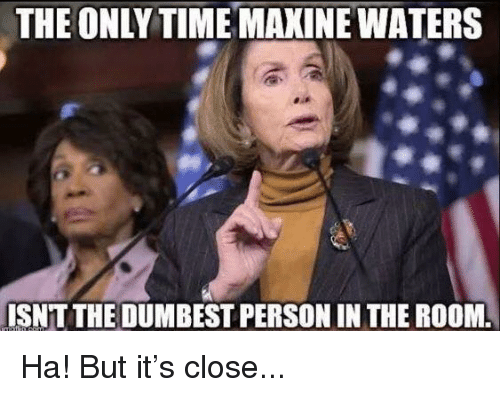 They aren't so foolish to not think that Waters is a liability to the Democratic party. Well, if you are COMPLETELY surrounded, I think that drawing a gun would only precipitate having it taken away for someone behind or to the side of you. I say just keep backing up as they gather to keep them in front of you and your loved ones. Then if you must draw at least there are fewer out of your sight picture. That or scurry away from the jerk causing the ruckus. MacDonald wrote: Well, if you are COMPLETELY surrounded, I think that drawing a gun would only precipitate having it taken away for someone behind or to the side of you. I say just keep backing up as they gather to keep them in front of you and your loved ones. Then if you must draw at least there are fewer out of your sight picture. If there are more than one in your group that is armed you would need to have a plan beforehand. With that said, this would have to be highly coordinated between the members in your group. If completely surrounded, the armed individuals would need to place themselves so their backs are facing each other, with unarmed friendlies and/or children in the middle. Then the armed members would have to draw their weapons simultaneously if that has not be done already. The attackers may or may not back off. Every situation is different. Hopefully that type of counter measure would make the attackers leave so you and your group can ex-filtrate the area and call 911. Regardless, if I'm surrounded and it looks like me and my loved ones are going to get hurt, I'm not worried about someone trying to take my sidearm away. That makes it clear that appropriate counter-measures need to be taken.